I love romance. I also love comics. I’ve made my fondness clear for both on numerous occasions. When they’re combined, I’m twice as thrilled. It has proven to be a very potent combination before. 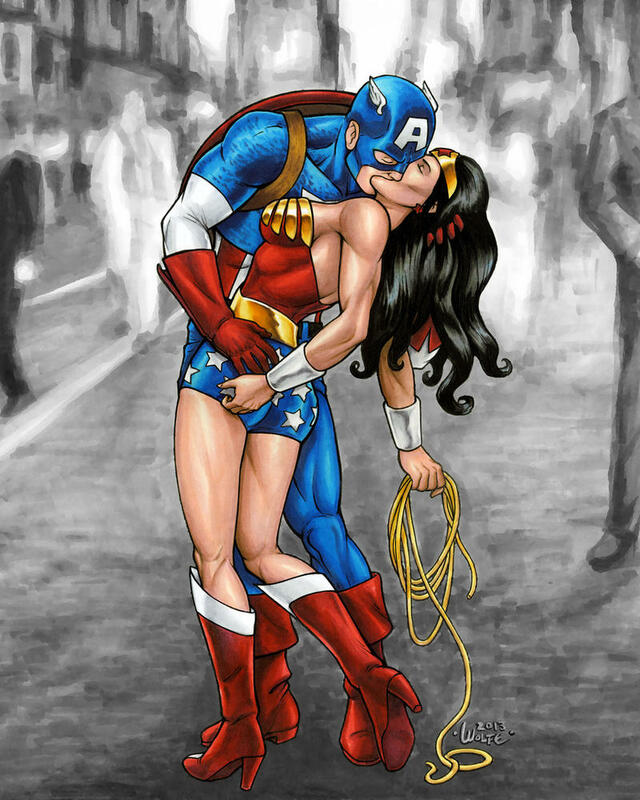 Like real life, comic book romance isn’t always done right, but when it works, it’s a beautiful thing. 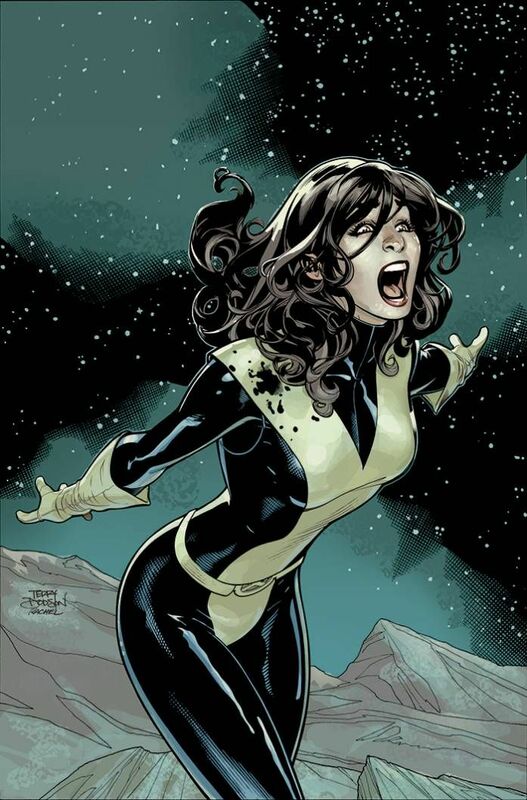 That’s what I had hoped to see with the release of X-men Gold #30, which was billed as the overdue wedding between Kitty Pryde and Colossus. 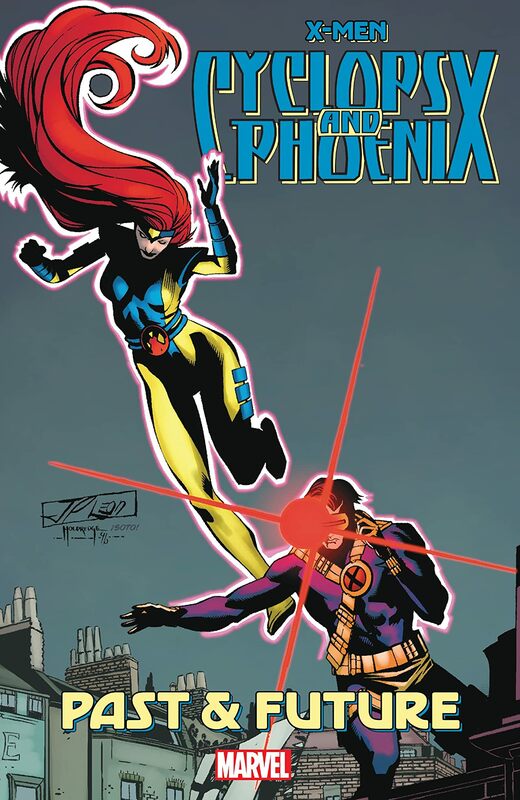 They’re one of the X-men’s most prominent romances, having a history that spans decades and includes death, resurrection, and being trapped in a giant bullet. I swear I’m not making that last part up. Earlier this year, I detailed why the Kitty/Colossus romance was so special in annuls of X-men lore. 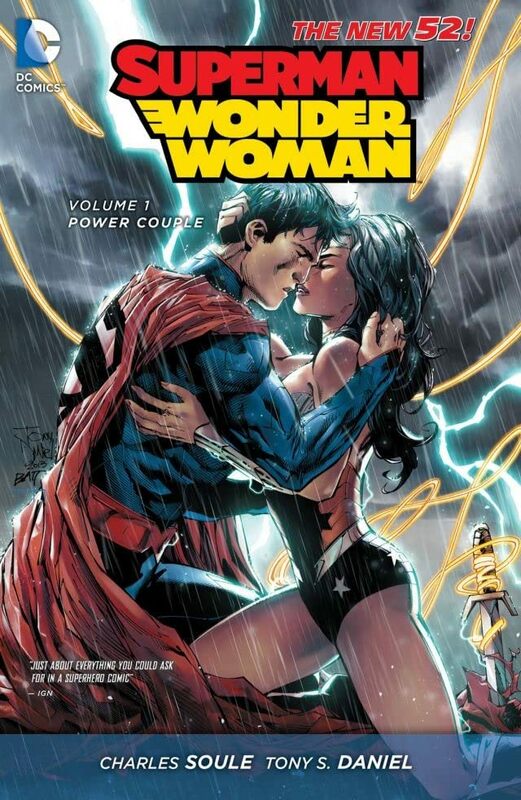 It’s one of those romances that isn’t assumed like Superman and Lois Lane. They have to actually work to make their relationship strong, which makes it feel more real than most superhero couples. It’s why I had such high hopes for X-men Gold #30. It promised to reward these characters for their love and the work they put into it. Being the romance fans I am, I’m a strong believer in having that kind of effort pay off for a couple. Sadly, and this was spoiled before the comic even came out, that’s not how things played out for Kitty and Colossus. I don’t mind spoiling it, either. Kitty and Colossus don’t get married. Kitty, for reasons that are more asinine than I can put into words, gets cold feet at the last possible second and calls it off. She doesn’t even wait until she and Colossus are alone so she doesn’t create this mass spectacle that is sure to humiliate and hurt someone she loves in a very public way. She actually gets to the point where Colossus is about to put the ring on her finger and that’s where she stops it. Short of punching his jaw after being told he can kiss the bride, it’s one of the worst things she could’ve done to this man. On top of that, Kitty was the one who proposed to him. This isn’t a case where a man pressures a woman into marrying someone or a woman feels pressure from her family and peers. The idea, request, and desire to get married came from Kitty and her being the one to call it off like that, after her friends and family did so much to help her, just makes her look more callous than an entire army of Lex Luthors. I wish I could provide some context to her decision. I really do. I just can’t find a believable way to make her decision anything other than an act of heartlessness, cruelty, and cowardice. There were no hints, whatsoever, in the events that led up to the wedding that would imply Kitty was having second thoughts. In fact, the events of X-men Gold #29 doubled down on her love for this man. Then, in just one scene that played out early in X-men Gold #30, it all comes apart thanks to a short, unspectacular conversation with Colossus’ sister, Illyana “Magik” Rasputin. It’s not dramatic. It’s not that revealing, either. Again, I don’t mind spoiling it. Magik just reminds Kitty that she and Colossus had to overcome a lot in order to get to this point. She also throws in that, if they were meant to be, it would’ve happened already. Bear in mind, Magik is considered one of Kitty Pryde’s closest friends on top of being Colossus’ sister. Even if that remark could be attributed to her alcohol intake, it’s still a terrible thing to say to someone who is about to get married. It’s one of those comments that shouldn’t have derailed a couple that has worked so hard to be together, but it did. Seriously, that’s all it took to convince Kitty that she had to stop the wedding, in the middle of the ceremony, and in front of all her friends and family. Considering she’s supposed to be a leader of the X-men and one of the toughest female X-men of all time, it’s pretty pathetic. Her decision and terrible timing, alone, could’ve made X-men Gold #30 one of the least romantic stories in the history of the comics. I still wouldn’t have put it on par with some very disturbing romantic sub-plots that played out in some Spider-Man comics. 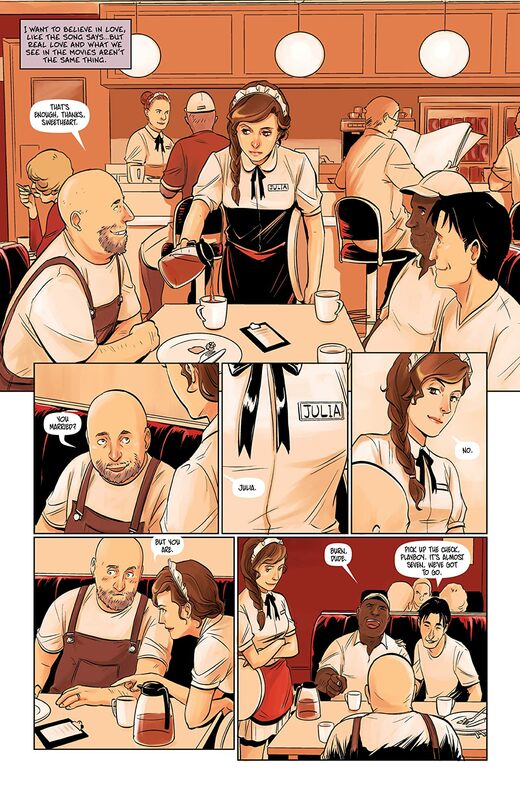 If breaking off a wedding was all this comic did, I would still appreciate it for how it imparted so much heartbreak into a story. However, it gets even worse than that. It wasn’t enough for X-men Gold #30 to undermine one of the X-men’s most likable romances. It actually succeeded in denigrating the entire concept of romance in superhero comics. I know that sounds like an exaggeration on my part, but I’m dead serious. Yes, Kitty and Colossus don’t get married in this issue. 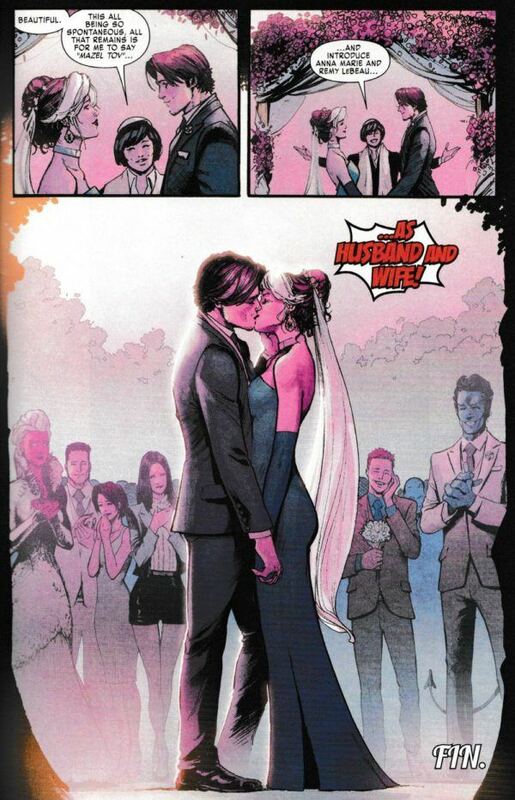 However, a marriage does occur and it is between another iconic X-men couple that I’m actually really fond of. 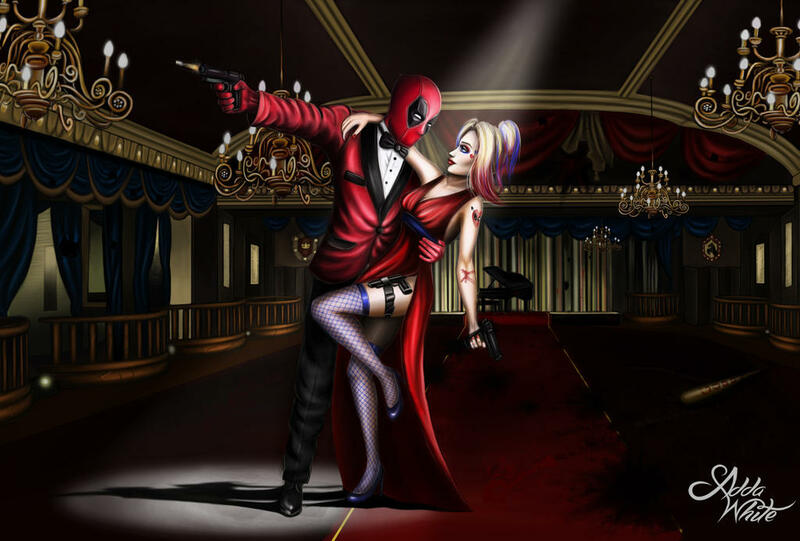 The lucky couple here is Rogue and Gambit. If you watched the old X-men 90s animated series, you understand why that’s a big deal. 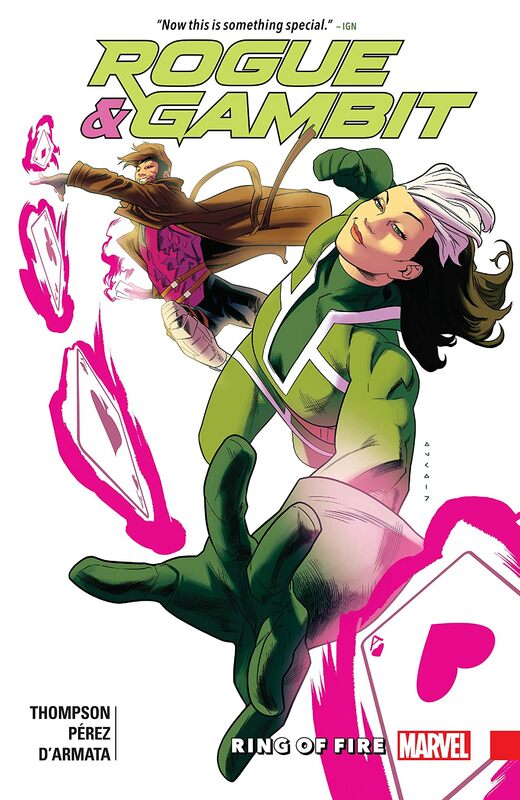 Now, I could write several articles on the quirks of the Rogue/Gambit relationship. 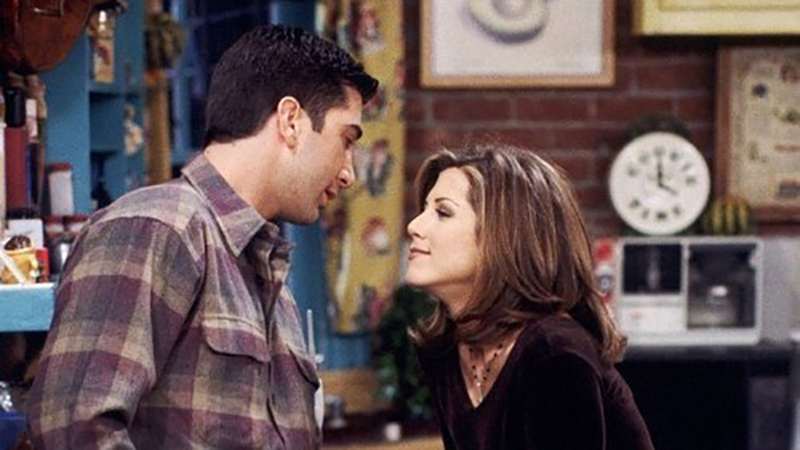 It’s another one of those romances that has become iconic in its own right. I would even go so far as to put it slightly above the Kitty/Colossus relationship, if only because both characters have had to deal with some pretty unique obstacles, the least of which involves Mystique being Rogue’s adopted mother. In the context of X-men Gold #30, though, those various quirks don’t really play into the moment. They haven’t even played into any of the events throughout X-men Gold that led up to this wedding. 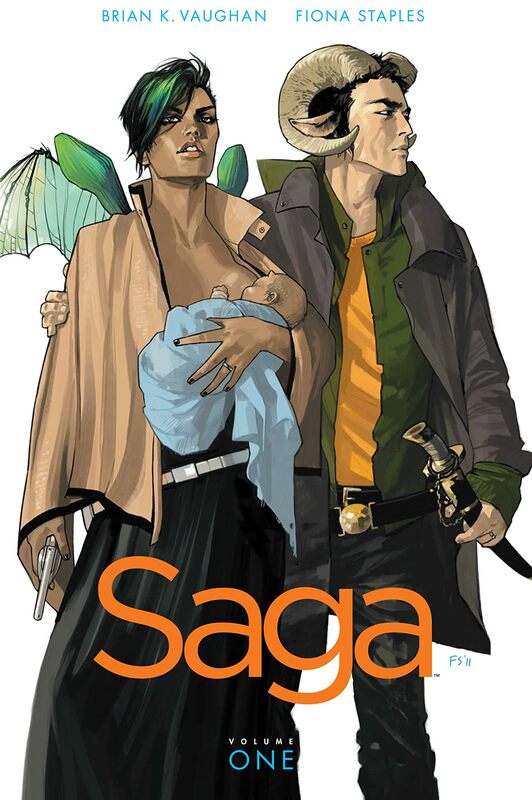 In fact, they only recently rekindled their relationship in a mini-series called “Rogue and Gambit” by Kelly Thompson, which I highly recommend. Even with that development, though, them getting married at this point would’ve been rushed, forced, and downright inappropriate, given what just happened to Kitty and Colossus. It would’ve given the impression that someone had to get married in this comic. It didn’t matter who, why, or for what reason. It just had to happen to salvage the issue. 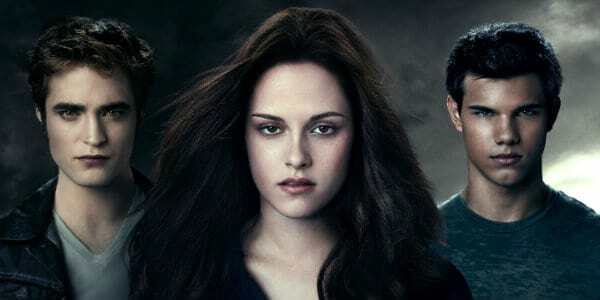 To hell with crafting a story that documents the emotional journey two characters make to get to that point. Never mind the fact that other iconic couples have gone on that journey and made for some of the most memorable moments in the history of comics. Just having Rogue and Gambit randomly decide, on the spot, to get married should carry the same weight. If I could write that with more sarcasm, I could. Again, I want to make clear that I like the Rogue/Gambit relationship. I’m glad their romance is evolving, once more, especially after some of the other characters they’ve been stuck with. The way it was handled, though, and at Kitty and Colossus’ expense, no less, was just downright demeaning to the very concept of meaningful romance. It sends the message that romance is as interchangeable as a box of frozen burritos. If one doesn’t heat up right, then another one works just as well. It’s not like they’re unique, having unique emotional dynamics and personal journeys specific to multiple characters. One is no more special or meaningful than the other. Again, if I could write that with more sarcasm, I would. 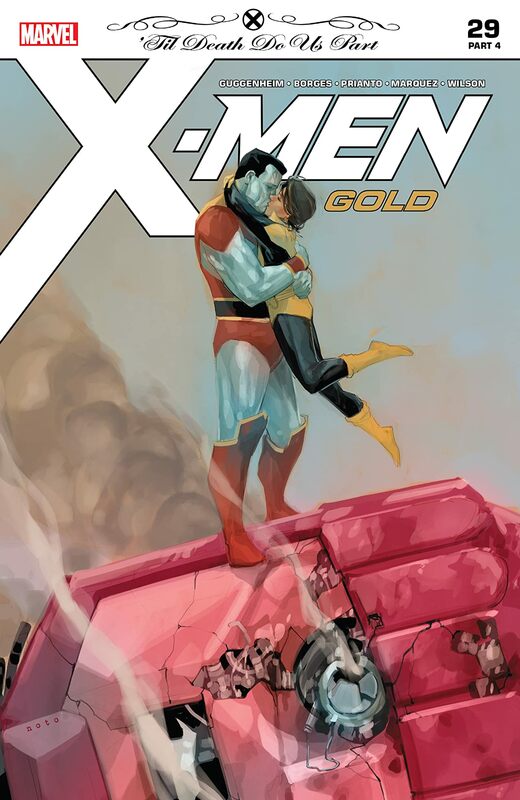 What happened to Kitty and Colossus in X-men Gold #30 was tragic, but it didn’t undercut romance in superhero comics, as a whole. As soon as Rogue and Gambit were randomly thrust into the moment, doing on a whim what took other couples so much time and effort, the whole issue undercut any deeper meaning that both romances had going for them. 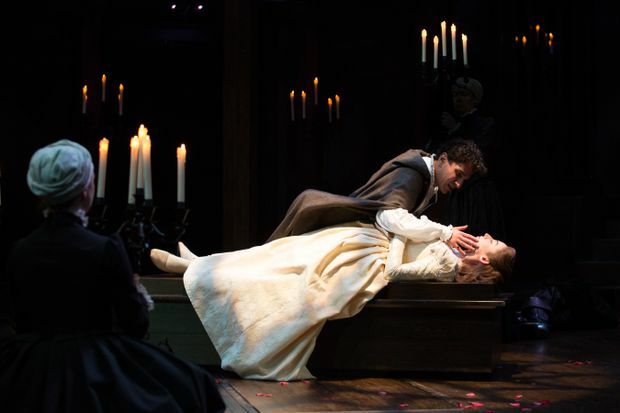 Great romance, especially those that go onto become iconic, can’t be the kind of exchangeable gimmicks that can be sold as easily as plastic cups at Costco. Great romance is like the cookies you bake with your grandmother from scratch. There’s work, patience, and a deeper personal touch to the effort. I get the appeal of throwing in a major twist. Comics, movies, and everything associated with M. Knight Shyamalan have been doing that for years. That appeal isn’t there in X-men Gold #30 because it comes at the cost of treating romance with the same recklessness as super-villains treat their henchmen. On it’s own, I thought X-men Gold #30 was just really disappointing for how it handled Kitty and Colossus. However, it’s the precedent and the implications that leave me concerned for the future of romance in comics, particularly Marvel. 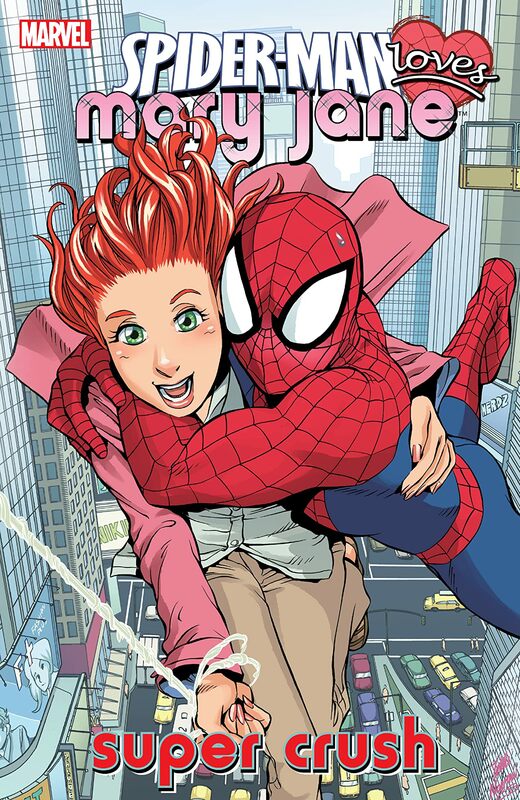 If this is how love is treated, as something easily cut and pasted into a plot, then I worry for other comic book couples that may face similar denigration. 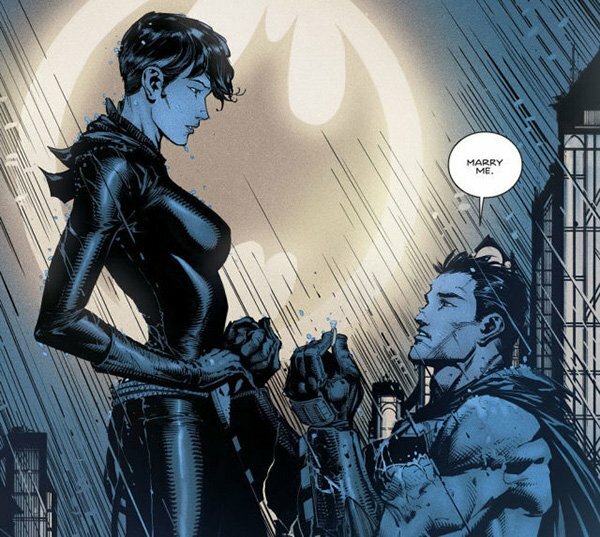 Here’s to hoping that the upcoming wedding between Batman and Catwoman sets a better precedent.